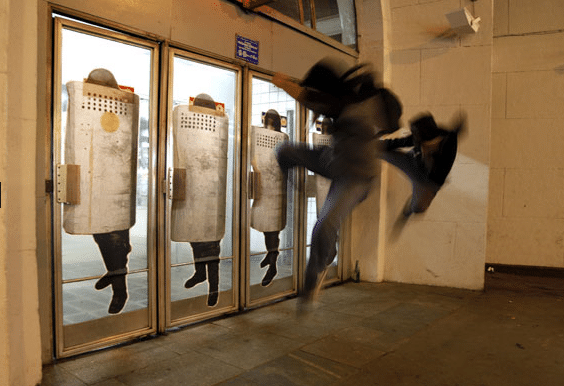 "Truth to Truth," an installation where the artist pasted images of riot police on doors of a Moscow metro station, allowing metro riders to 'push back' when they opened the doors. The secretive P183 only appeared on camera or in photos with his face obstructed. 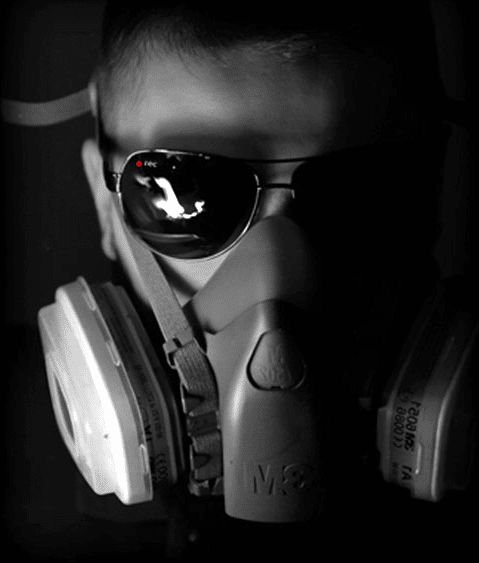 I believe all art should be anonymous, Pasha 183 told Interview magazine in 2012. Thus, little is known about him, since a life of anonymity was necessary for the Moscow-based street artist, who also went by P183. Russian and British press peg his age at death in April, 2013 as 29, and note that for his young age, his street art career spanned 15 years. The only other fact known about the artist is that he studied “communicative design” at university. It is rumored that his real name is Pavel Pukhov. P183 says his interest in street art began while he was a pre-teen boy, writing poems and drawing pictures on Moscow’s Tsoi Wall, which commemorates the much-beloved front man of Soviet rock group Kino. Growing up in a big city, graffiti was a common sight for P183, as was the rise of post-Soviet consumerism and advertising. Many of P183’s works address the omnipresence of commercial advertising, and made clear his views on mass consumerism. 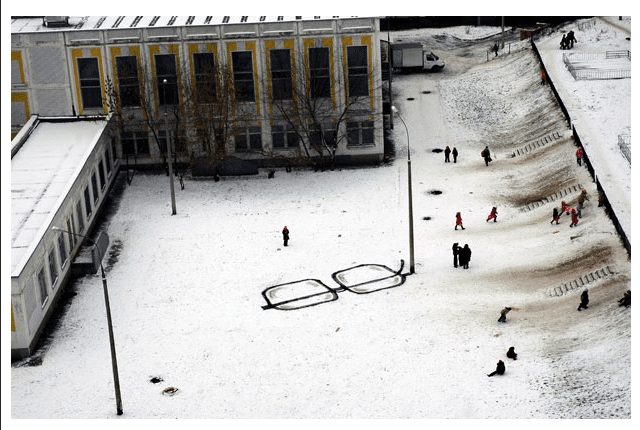 In one piece, September 2012’s “About Advertising,” the artist set up an installation near a Moscow park where the artist’s versions of advertisements and logos were stenciled onto concrete. Nearby, he positioned a life-sized black-and-white cutout of a man vomiting a stream of white, which then becomes the stream of white paint on the concrete ‘crossing out’ the advertisements and logos. A video of the artist installing the work can be seen here. Another strong commentary was November 2012’s “Zoo.” In this installation, the artist took to a pedestrian walkway near a construction zone and turned it into a zoo exhibit. The walkway had been haphazardly fenced in with wire and the artist envisioned it as not unlike a cage. 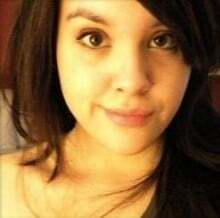 Against the wall, he hung a giant banner depicting monkeys that stretched the length of the walkway, and hung bunches of bananas from the walkway’s wire fence. As people walked through the walkway, it became a visual pun, likening the pedestrians as monkeys in the zoo. A video on the installation’s construction can be seen here. One of the artist’s more lighthearted works. One of the artist’s more famous (and lighthearted) works is his installation that used a lightpost in creating a pair of giant, partially folded eyeglasses. The rest of the eyeglass frames were drawn in black paint extending from the post into the white snow.